Here is my own Yearly Tradition! Every year I start my first blog post on the books I read the previous year. Here is the list from 2010, 11, 12, 13, 14, 15, 16, 2017. Here are the books that journeyed with me in 2018. 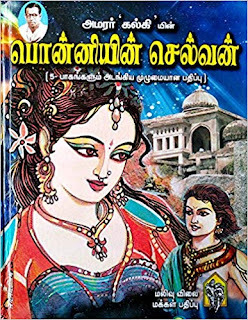 This is a must read for anyone who loves Tamil. My sister had gifted all the 4 parts and I had some false starts earlier. It was difficult to read at the beginning but the flow kicked in and I was reading at a good pace. The story and plot is intricate and thoroughly enjoyed it. Reading in one's mother tongue is a totally enjoyable experience. 2019 planning to add more Tamil Titles to my reading list. I enjoyed The Da Vinci Code and wanted a breezy read. So picked it up. Man it was exhausting. Story moves so fast and there is so much of information on European sculptures and churches. Good time pass. If I am going to visit the Vatican will re-read this book. Can enjoy the city.